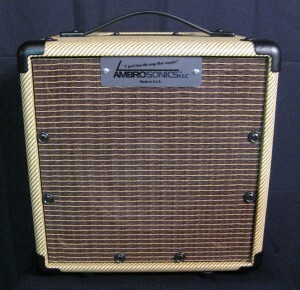 AMBROSONICS Passive 8 inch Monitors new for 2015! 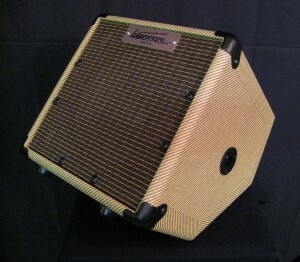 Description: This little light weight blond tweed monitor has an 8 inch, 8 ohm whizzer cone speaker that kicks! Speaker monitor handles 60 watts RMS and 85 watts max with a great full range sound for vocals, acoustic or electric guitars. 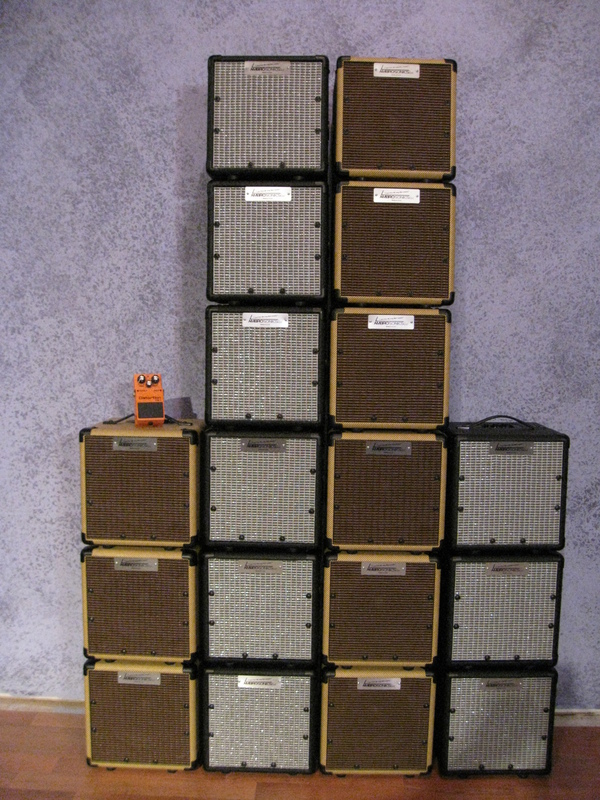 With a frequency response from 39Hz to 16KHz, your vocal or guitar POPs right out of the mix. The whizzer cone extends the high end naturally so no tweeter or horn is necessary. This minimizes that annoying feedback and allows a great full range sound to inspire your performance. The less than 12 pound monitor can sit straight at 90 degrees or get kicked back for a 45 degree angle perfect for this custom sized monitor. The monitors also fit on standard microphone stands from either side and stack up on top of each other nicely. 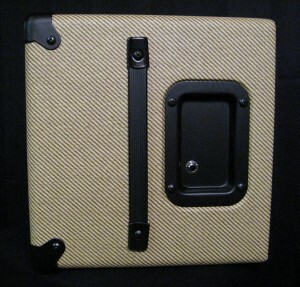 This unit has identical specifications as the black wrapped monitor, but with brown/gold grill and tweed wrap. 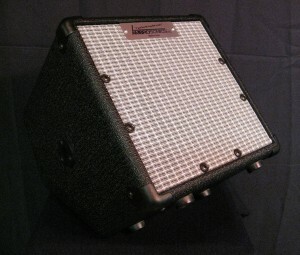 Description: Our little light weight black wrapped monitor has an 8 inch, 8 ohm whizzer cone speaker that kicks! Speaker monitor handles 60 watts RMS and 85 watts max with a great full range sound for vocals, acoustic or electric guitars. With a frequency response from 39Hz to 16KHz, your vocal or guitar POPs right out of the mix. The whizzer cone extends the high end naturally so no tweeter or horn is necessary. This minimizes that annoying feedback and allows a great full range sound to inspire your performance. The less than 12 pound monitor can sit straight at 90 degrees or get kicked back for a 45 degree angle perfect for this custom sized monitor. 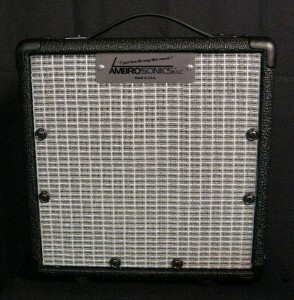 This unit has identical specifications as the blond tweed monitor, but with silver grill and black wrap. Description: The Tweed monitor as shown from the front view. Description: The Black monitor as shown from the front view. Description: Boss DS-1 to show scale on these little but big sounding monitors. Description: Both the Blond and Black have the same dish 1/4″ connections. Description: This shows the Microphone Stand Mount on both sides of the Black and Blond Monitors. 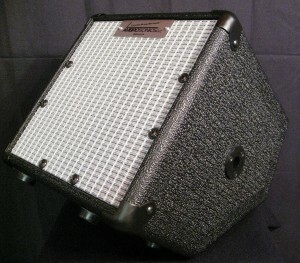 Tough, sturdy little cab is made in the USA! 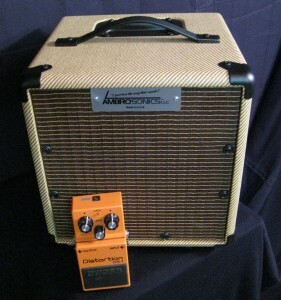 Yes, that’s a Boss DS-1 Distortion Stomp Box shown for scale! Black or Blonds are IN STOCK… Order Today!